Deloitte’s Global Human Capital Trends 2016 report is a wake up call for learning and development departments. The report confirms the shift away from the traditional approach of designing, developing and delivering corporate programs to develop people, to innovations and approaches that enable people to develop themselves every day. This shift from development and delivery to technology enabled, continuous learning is one of the most important changes in corporate learning over the last 25 years. The simple answer is that the old model is no longer good enough. Learning and Development (L&D) departments cannot keep up with the pace of change both inside and outside their organisations. They can design valuable core skills programs and these are important. However, they cannot know all the latest changes, some of which may have only happened this morning, develop content or programs based on these changes and deliver them within hours, embedded within the tools and apps employees are using for their work. What L&D departments can do is empower and equip employees, and encourage them to discuss, share, learn and curate knowledge every day. L&D can also leverage the knowledge of employees to improve the collective intelligence of the organisation as a whole. Continuous learning requires a different mindset and a new approach to learning technology and learning content. Learning technology is not a platform or a destination such as an LMS or an academy, whether on mobile or desktop. Continuous learning is about integration across a technology stack that allows employees to learn, share and curate across all the applications they use. Continuous learning technology is about integration not platforms. It’s a journey not a destination. Learning content is primarily developed outside the learning department and indeed outside the organisation. Employees need constant access to new ideas, processes, client developments, case studies, research reports and new product news. The majority of this content is externally generated from articles to videos to discussions. Learning departments simply cannot develop all the content needed by employees for continuous learning. Courses don’t stay up to date. Continuous learning is collaborative. It involves all stakeholders, including L&D, but also line managers and learners themselves. Continuous learning is about leveraging collective knowledge. L&D are increasingly the enablers not the providers of learning. This is why L&D need to become expert at curating content, to fuel collective intelligence building in teams. The recent Deloitte report reveals that employees at all levels expect self-directed learning opportunities. They expect to learn continually from always-connected mobile devices from access to articles, videos, podcasts and chat. Organisations have to provide self-directed learning opportunities and allow employees to lead. Tools such as Fuse allow employees to easily and quickly create, share and discuss learning content. This user-generated content is increasingly important but employees also need access to external content. We see seven significant shifts taking place. It is not enough to search when we need something. How do we know what we need to know? Yet, we can’t read the millions or thousands or even hundreds of articles published daily. What we need is a filtered daily briefing. A filtered view that gives us context and we can ignore or explore issues deeper as we need. The nature of the filters may vary but can include our colleagues, content shared by experts, news from industry sites and algorithms based on our needs and interests. Not all the knowledge that employees need to be effective can be found inside the organisation. We have to look at external sources from competitor developments to industry news and to new product or service innovations and research reports. We need to give employees access to external information in an efficient way. Pointing them at Google isn’t good enough. L&D needs to make it easy to find what you need. Towards Maturity showed in their report last year that 88% of learners want to be self-directed. Employees need to drive continuous learning and have access to new information daily. Employees and their teams can decide what is important and flag or comment on developments. L&D departments can leverage this knowledge. On demand continuous learning doesn’t simply mean a platform available on desktop or mobile devices. That is a basic necessity, a given, but not enough by far. Continuous learning technology is with you wherever you are, whether you are in a browser or in Slack, providing the news and information you need or allowing you to flag, comment or save content. There should be no friction or firewalls in sharing and collaborating. Users won’t naturally go to your LMS to find out what’s new, but they might be in Slack or other systems and apps. The idea of the central LMS or academy needs to be rethought Continuous learning is about integrating information across the technology you use. You need to hang out where your learners are. If they’re remote, then you have to support their remote working stack. Key to integrated technology stacks are APIs for learning. These connect features and functions seamlessly as part of a stack so a learner doesn’t have to visit different systems. They can filter and pull through information and knowledge from external sources or from their team. Learners don’t need to sign in or jump to different platforms. Modern L&D departments leverage the power of employees. No one is as smart, or as knowledgeable, as everyone. Employees are encouraged to explore and discover from anywhere but importantly they can highlight, comment, save or share content. Others such as L&D can review, curate and add value to these actions. 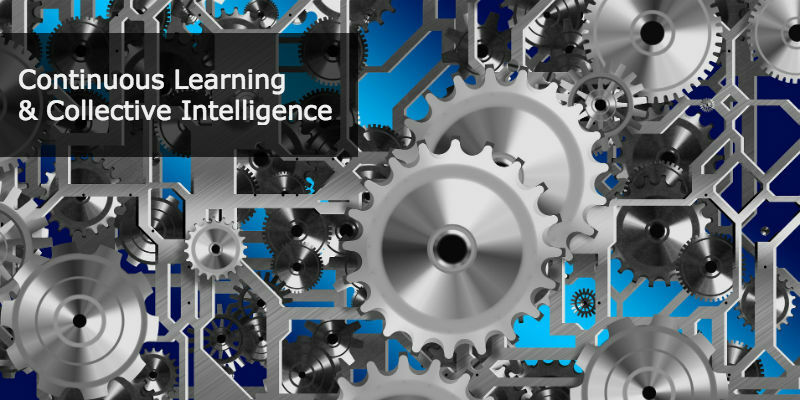 Continuous learning is about enhancing an organisation’s collective intelligence. Are your skills and knowledge more valuable today than 6 months ago? This is the key test for continuous learning. We can ask the question of ourselves and of the staff in our organisations. Our skills have a shelf life. No matter what training or expertise we’ve gained, we’re becoming less relevant every day if we’re not keeping pace with change. That’s true for L&D, and everyone else. And a good 21st century addition might be: “If you stop learning, you’ll stop earning”. We may not have it perfect or even right, but our new Anders Pink app is designed to support continuous and collaborative learning. We also have an API so you can plug recent and relevant content directly into your existing Learning Platform and LMS. It’s free, give it a try and let us know what you think.